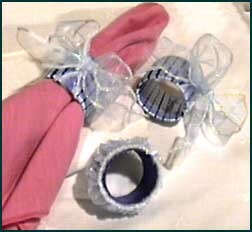 You can make elegant napkin rings for your next dinner party for very little money, using ribbon and cardboard tubes. It's easy! Cut a toilet paper tube into thirds, so you have three equal rings. This is the size I like best for napkin rings, but you can make yours thinner or fatter if you prefer. You may want to measure and draw lines before cutting, but since the rings will be covered it's not necessary to be TOO precise. Paint the inside and outside of the rings. (I like to use a shiny metallic acrylic paint that will shine through the ribbon.) Allow paint to dry completely, then decorate. Cut about a 4 foot length of the narrow ribbon. Glue one end to the inside of the tube. Wrap the remaining ribbon around and around the tube, leaving a small space between each wrap if you want the paint beneath to show through. 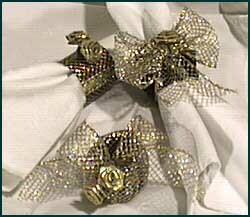 Finish by tying a wider piece of ribbon around the ring and tying a bow. Glue lace around the edges of the tube. Attach small silk fs with hot glue or craft glue. Cover the ring completely with a lacy ribbon or strip of material. Buy wire edged ribbon that's about the same width as your rings. Cut about an 8" length. Starting on one side, grip the end of the wire and pull to gather the ribbon material. Repeat on the other side. 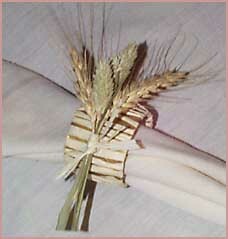 Glue the gathered ribbon to the outside of your ring. Decoupage pretty pictures to the tubes. Spray with varnish to "finish".